The idea of a kaleidic economy or society is strongly associated with George Shackle and his vision of Keynesian kaleidics. This essay asserts that the central thrust of the Austrian tradition in economic analysis can be described by the term Viennese kaleidics. In either version of kaleidics, the analytical stress is placed on treating time seriously and not just notionally. Either version of kaleidics leads to recognition that economic processes are better treated as turbulent than as equilibrated. While that turbulence is a natural feature of the unavoidable incompleteness of intertemporal coordination, it is subject to mitigation. This essay explains how it is that individual liberty and private ordering is generally superior to state policy and public ordering in calming the turbulence that naturally characterizes a kaleidic economy. This is a revised text of my presidential address to the Society for the Development of Austrian Economics, Washington, DC, November 20, 2011. I’m grateful to Peter Boettke for offering helpful comments on an earlier version. Wagner, R.E. (2011). A macro economy as an ecology of plans. 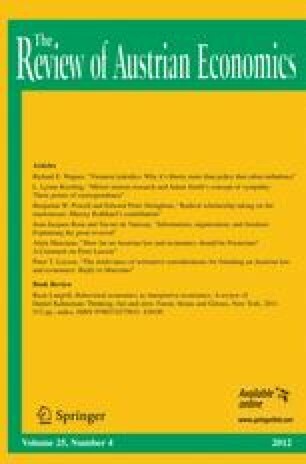 Journal of Economic Behavior and Organization. doi: 10.1016/j.jebo.2011.07.019.